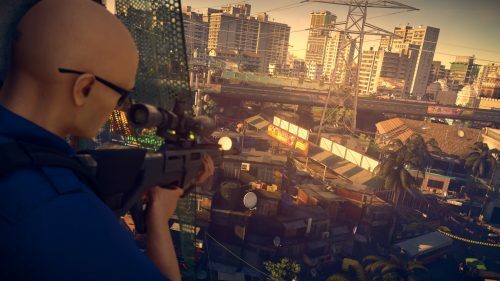 2016’s Hitman reboot was an experiment for IO Interactive. 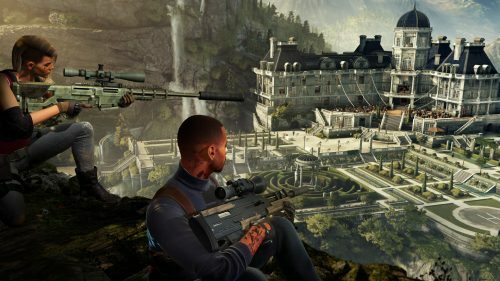 They promised fans that levels would not only be larger but the game would also receive frequent updates in the form of Elusive Targets and other bonus content. The idea was that the game would always be expanding and keep players invested indefinitely. 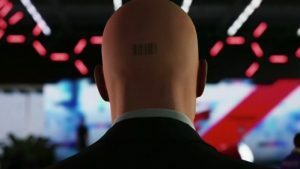 Unfortunately Hitman’s episodic release format did not sit well with fans and critics alike, ultimately doing the reverse of IO’s goals and driving players away (at least until the full season was finally released). 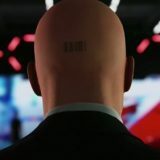 Hitman 2 brings with it a full set of new levels as well as some new gameplay modes and various enhancements. While not changing up the core content too much, Hitman 2 is a quality follow up that should not be missed. Hitman games have never really had a captivating story. Following on from the events of Season One, Hitman 2 sees Agent 47 and his handler, Diana Burnwood, track down the elusive Shadow Client. This mysterious assassin orchestrated the events of the previous game and continues to cause chaos around the world, but more importantly also seems to know the origins of Agent 47. Cutscenes are presented via simple narrated storyboards, which are at odds with all of the flare and the quality visuals used in the rest of the game. It gets the job done but the plot tends to jump around and feels loosely connected. Anyone who has played Season One will be all too familiar with the setup of the main campaign. At the start of each level players will receive a short briefing of who the targets are and get a couple of hints on how they should approach missions, such as potential kill opportunities and where the targets will be located. Playing on lower difficulty settings will mean you get prompted when assassination opportunities present themselves. This usually involves players overhearing NPC conversations about a target, and then being guided in how to take advantage of the intel. For example, upon overhearing a mechanic has become disgruntled and walked off their job, you can steal their clothing to disguise yourself and then do a dodgy repair on the target’s racing car. On the highest difficulty all these prompts are turned off, so you will have to work it out for yourself. Combined with limiting you to only one manual checkpoint to go back to if you make a mistake, this will give players a true challenge and put their skills to the ultimate test. Like Season One, Hitman 2 encourages multiple playthroughs. Each target has several ways of being assassinated, including drowning, unfortunate “accidents”, strangulation and even just a quick shot of a firearm. There are so many methods of killing a target that it’s impossible to see every single one without replaying a level several times. The game does point players in the right direction by listing challenges, but it’s up to you to discover how to play out the scenarios. The level design is great as if you’re having trouble completing one assassination scenario you can easily abandon it and find another; almost like a puzzle that can be solved in multiple ways. Players are rewarded for carefully planning out stealthy kills and gathering intel on the target – rushed players will be quick to trigger alarms and security personnel who will make short work of Agent 47. There’s a lot of satisfaction to be had from working out how to assassinate a target and then watch it unfold precisely how you envisioned. 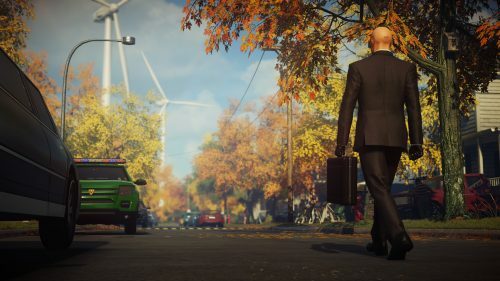 Arguably one of the main attractions of the newer Hitman games are the large sandbox environments. 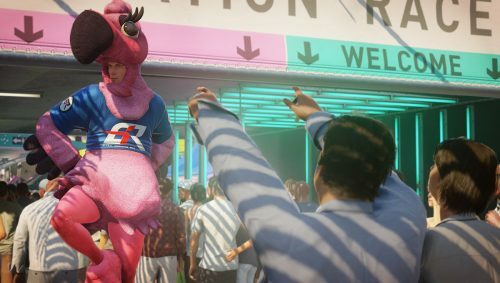 Hitman 2 doesn’t disappoint, offering varied levels that have their own distinctive feel. New Zealand offers a night time setting on the beach, with Agent 47 breaking into a luxury home and gathering intel on the Shadow Client. Mumbai, India sees players explore the slums of a poverty stricken district, complete with street gangs, market stalls and a tall under construction skyscraper. Miami sees players navigate a giant tech company with the aim of assassinating the CEO and also his daughter who is racing on a nearby Formula One track. Columbia features a jungle setting allowing for Agent 47 to hide in shrubs while targeting the local drug cartel. Whittleton Creek, USA is arguably the best of the lot, putting players in a suburban setting as they sneak into houses and assassinate a former KBG Agent who is under the protection of the government – in some ways it feels like a remake of the ‘A New Life’ scenario from Hitman: Blood Money. Last but not least is the Isle of Sgàil, a mysterious fortress that is the gathering location of a cult. Some levels are wide open and have crowds of people at every turn, while others will feel more compact and will see players ducking between rooms and buildings to avoid being detected. No two locations feel quite the same and they also complement the existing levels from Season One, which coincidentally can be played in Hitman 2 providing you already own it on the same account or you can pay AU$29.95 for the Legacy DLC pack. Over the last two years IO Interactive have made refinements to their gameplay engine for Hitman 2. One of the new features you can expect is the ability to blend into crowds a la Assassin’s Creed and remain hidden in plain sight from NPC enemies. NPCs that are facing a mirror will also now see your reflection and be alerted to your presence, so this brings a new dynamic to consider when approaching targets from behind. There are also a handful of new weapons and assassination options available, though we’ll keep those a secret so as not to completely spoil the fun. While the refinements are a welcome addition, the truth is that Hitman 2 still plays largely the same as Season One. This isn’t necessarily a bad thing, but you can almost view the game as an exceptionally large expansion rather than a full blown sequel. On the plus side, all enhancements have been retrofitted into Season One’s levels, so it’s worth replaying them at least once. Contracts mode makes a welcome return. Here players can create their own missions by selecting any NPC character in a level and making them an assassination target. If you’re feeling especially creative, you can add special conditions such as using a particular killing method or requiring a particular disguise be worn. You can then upload and share the Contract online. Better yet, you can also take on missions made by other members of the community. It’s a great compliment to the main campaign and has tremendous amounts of replay value. New in Hitman 2 are the Sniper Assassin and Ghost modes. Sniper Assassin is similar to the Hitman: Sniper mobile game where you control a stationary Agent 47 and must assassinate all the targets in a level using a sniper rifle. There are three main targets and their bodyguards to dispose of, all of whom are moving around a countryside mansion. There’s a surprising amount of depth here as you can trigger explosions by firing at gas canisters, you can kill targets so that their bodies land in water (and are hidden) and you can obtain bonus points for chaining kills and getting headshots. If a body is discovered then this will cause the targets to run away to an exit point and should they escape it will be game over. The only real disappointing thing about the mode is that there is only one level, however IO Interactive plan on adding more post-launch. Also, the mode can be played via two player online co-op. Ghost mode is a competitive 1v1 online multiplayer mode where the first player to kill five targets wins. 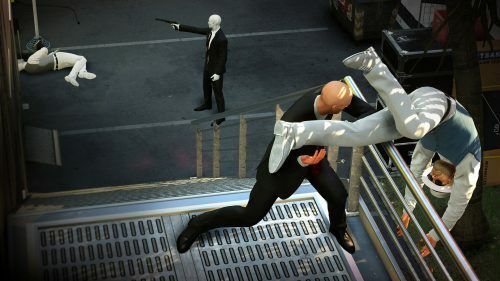 Your rival is displayed as a white silhouette of Agent 47 and the two of you will both have the same target but your actions in one environment will not affect the other player’s. For example, if you kill an NPC and there are witnesses you will be hunted down by security forces. In your opponent’s screen they will not see the NPCs hunting you down and their environments will remain unchanged. 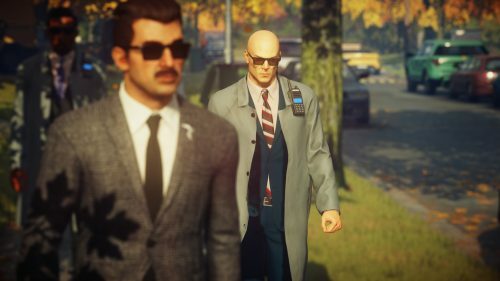 In a way this mode contradicts what makes Hitman such a great franchise – the thrill of slowly closing in on your target and planning out every last detail before the killing strike. Instead, the mode makes you feel rushed as you are now competing against someone else. As a whole the mode is functional, but compared to the other modes available it’s not nearly as engaging. The visual engine has also received some minor upgrades, and the Season One levels once again benefit from being retrofitted. Firstly, the original game had a slight red hue which has been changed to a cooler colour temperature – it’s not even something you’re likely to notice unless comparing both games side by side. There are also enhanced bloom and glare effects, which are particularly noticeable when the sun is in the backdrop of a level. Players will also have the option to make the game focus on providing a smoother framerate or enhancing the graphical output. Playing on an Xbox One X console, I did notice framerate drops when I had the enhanced visual option selected particularly in crowded areas. I mostly played keeping the smoother framerate option selected, though some larger particle effects (namely one “bonfire” scene where I executed a target in a fiery blaze) saw the framerate drop again. It is amazing though how well the game performs when there are large crowds on screen. It’s a technical marvel that IO Interactive should be proud of. Hitman 2 is a great following up to 2016’s reboot. It offers up a complete package of new levels, additional single-player and multiplayer modes, minor gameplay and visual enhancements and continues to be one of the best assassination stealth games available on the market. Just keep in mind the game plays very similar to Season One, you will encounter framerate issues from time to time, and the narrative isn’t particularly engaging. Rocket Chainsaw reviewed Hitman 2 on an Xbox One X system. It is also available on PS4 and PC.